Light the Raven Signal!! Something is happening! Sarah: How did you hear about this guy again? Sean: Uh, my friend Kyle from fantasy baseball said he helped him out of a jam once. 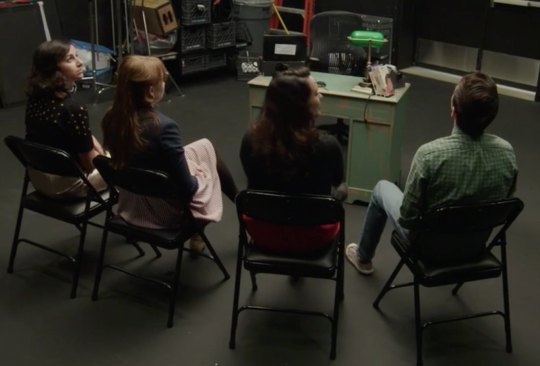 MK: Isn’t it weird to have an office on a sound stage? 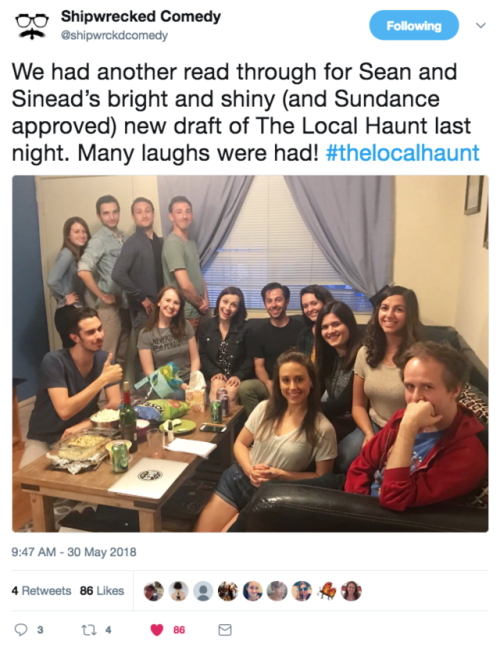 Sarah: I mean at least it’s on a studio lot. That’s gotta be a good sign, right? [Title]: Who is Shipwrecked meeting? 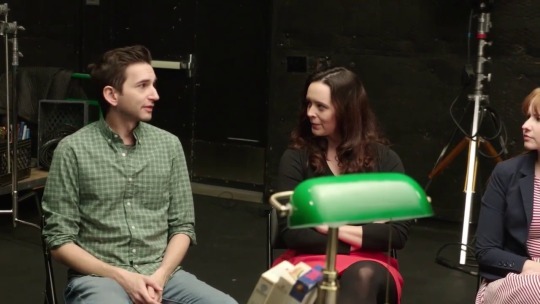 There’s a green-lampshade lamp and a dark… something… on the edge of the desk closest to Our Heroes (partly obscured by Sarah’s head). There’s a Rolodex. 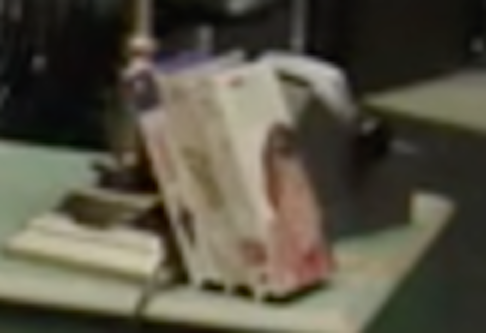 And there are three VHS tapes leaning against the lamp. I can’t quite tell what movies they are, but it would be cool if they were significant. Anyone recognize any of those? 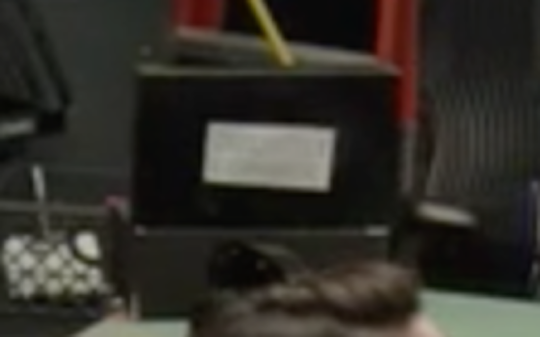 No idea what that is, but I’m guessing it’s involved in the scene we’ll see tomorrow. Backing up and putting on my speculation hat, what do I think? I think it’s a new project (obviously). I think whoever comes through the door is going to be someone cool and exciting for Shipwrecked fans (since otherwise it would feel like a bait-and-switch to tease his identity so hard). Hm. OR… he could be a floor wax AND a whipped topping. That is, he could be a real person we’d recognize and be excited to see, but in-character as a fictional character involved in whatever the new project is. dear art historian tumblr: how long did it take John Singer Sargent to complete a painting, on average? Disclaimer: Not an art historian. Just a Sargent fan. It’s a bit of an apples-to-oranges comparison, because some works (El Jaleo, Gassed) were huge; more than 10 feet long. For works like that, or works where a lot was riding on the painting as he tried to build his reputation, he spent a looooong time. For El Jaleo, one of his first works to catch the attention of the Paris art world, he worked intermittently for nearly two years. For Madame X he began sketching in June, 1883, and didn’t finish the painting until October or thereabouts, so, five months? After the disastrous reception of Madame X at the 1884 Salon he relocated to England, where his next major work was Carnation, Lily, Lily, Rose, which he worked on for more than a year, from September 1885 until October 1886. The time on that one was extended by the fact that Sargent chose to paint it en plein air in natural light, and specifically at dusk, when the light that he wanted to capture was just right. After securing a commission through negotiations which he carried out, Sargent would visit the client’s home to see where the painting was to hang. He would often review a client’s wardrobe to pick suitable attire. Some portraits were done in the client’s home, but more often in his studio, which was well-stocked with furniture and background materials he chose for proper effect. He usually required eight to ten sittings from his clients, although he would try to capture the face in one sitting. He usually kept up pleasant conversation and sometimes he would take a break and play the piano for his sitter. Sargent seldom used pencil or oil sketches, and instead laid down oil paint directly. He wrote to Ada Rehan (an actress whose portrait he’d been commissioned to paint, and who was anxious about the length of the sittings due to a recent bout of ill health), “I should argue, with more truth than seems likely, that a great many people find it rather a rest to [sit for a portrait] than otherwise, and also that some of my best results have happened to be obtained with a few sittings… (Lady Agnew was done in six sittings), but I always admit beforehand that it may take me much longer.” After the sittings there was then a longer period in which Sargent would finish the portrait; in the case of Rehan’s portrait Sargent worked on the piece from the spring of 1894 until March of 1895, so roughly a year. Calendar time from start to finish is only one way of looking at it, though. At the peak of his portrait-painting Sargent was producing many portraits each year, so clearly the work on them overlapped. Also, the monumental portraits were relatively time-consuming compared to smaller paintings. You didn’t specify portraits; you just said “paintings.” So, looking beyond the portraits (which he mostly stopped painting after he closed his studio in 1907), in the course of his career he produced roughly 900 oil paintings and more than 2,000 watercolors. Ignoring the charcoal and pencil sketches, that makes 2,900 painted works in a career that spanned roughly 45 years. Doing the math on that, and taking no account of time spent traveling/vacationing, it appears that he averaged one finished painting every 5.7 days. Go John Singer Sargent! Way to paint, dude! It’s looking better for Dongfeng with each passing minute. Still too close to call. 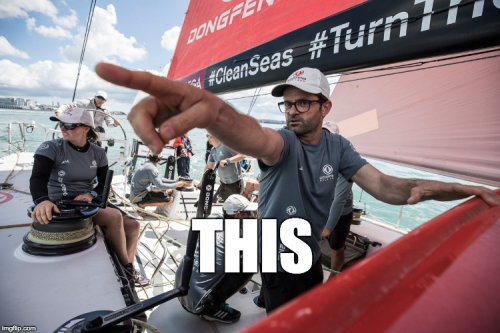 Dongfeng’s sailing about a knot faster than MAPFRE and Brunel. Brunel, behind MAPFRE, gybed away to the south a few minutes ago. Presumably that looks like a slightly slower course, but when you’re behind with the finish approaching you have to take chances. MAPFRE gybed a few minutes later to cover. 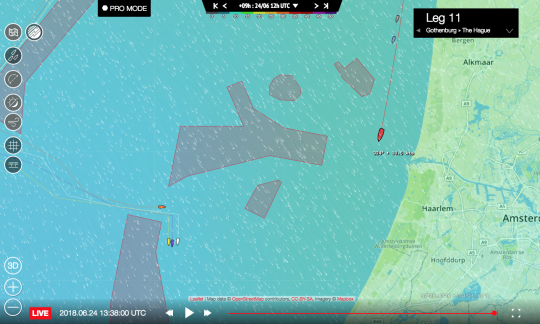 Covering makes sense, but there’s a potential downside: If they fool around too much with Brunel it increases the risk that Dongfeng will pass them both for the win. At the back of the fleet another cool story is playing out. TTToP (blue tracker symbol) and Scallywag (gray tracker symbol) are close together at the bottom of the overall standings. Everyone on TTToP has been saying the last few legs that their goal is to get out of last place by passing Scallywag in the overall standings. But to do that they not only have to beat them; they have to finish with at least one boat between them. 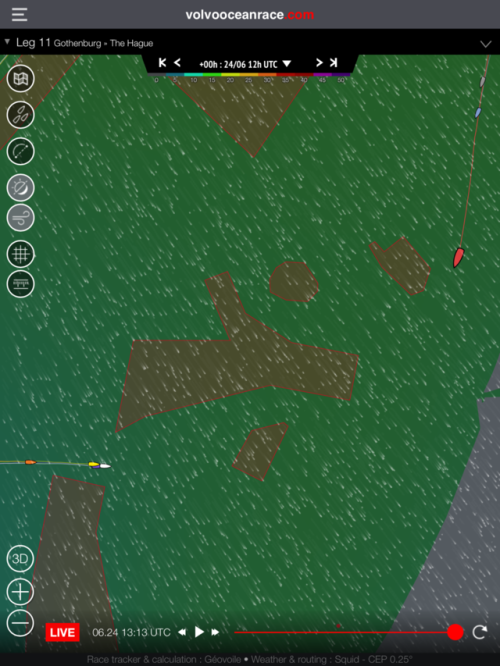 I can’t say for sure, but it looks like Vestas might be that boat. Not only is there a nail-biter at the front of the fleet, there’s a secondary nail-biter at the back. And it’s all going to play out over the next few hours. MAPFRE has retaken the lead in the western group, which is now heading in toward shore. Brunel is less then a mile behind them, with the no-longer-in-the-running (in terms of overall standings) AkzoNobel in between. 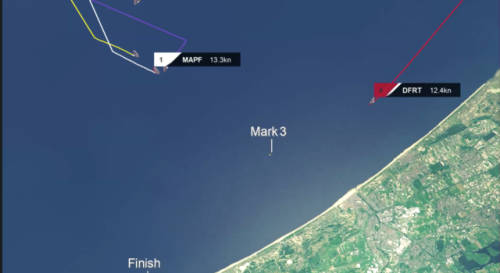 Dongfeng is approaching from the north, roughly 2 miles behind MAPFRE in terms of the distance they’ll need to sail to the finish, but with a faster angle such that they’re (right now) sailing about 3 knots faster. So they’re catching up, but we’ll just have to wait to see if they’ll have enough time to catch them. I only follow this through your posts but now I am very curious how it will play out! 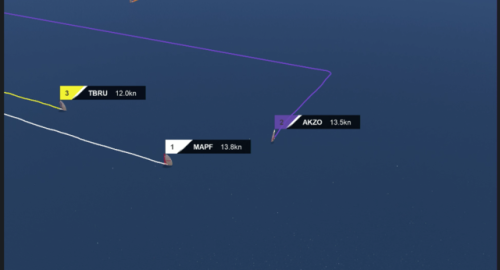 MAPFRE has re-taken the lead in the western group; Brunel is less than a mile behind them (with the no-longer-in-the-running-for-the-overall-win AkzoNobel in between). Dongfeng is chugging down the coast with about 2 miles more to sail to the finish, though they’re also sailing about 3 knots faster over the bottom, with part of that being because they’re at a faster sailing angle and the other part because they’re closer to shore with less adverse current. 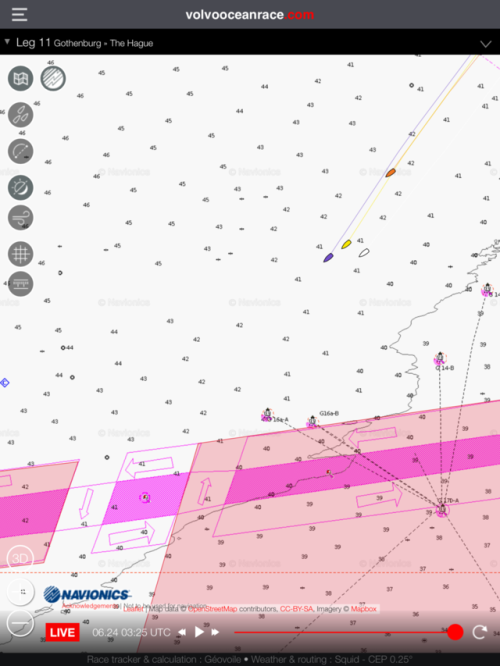 Brunel is still narrowly leading MAPFRE in the western group; Dongfeng and the inshore group are losing ground. But that was expected; they knew they’d be sailing a slower angle for a while. Their hope is that the inshore route will pay off at the very end, when the western group has to fight their way in through light winds. The whole race is totally going to come down to the last few miles. Sunrise on the North Sea. 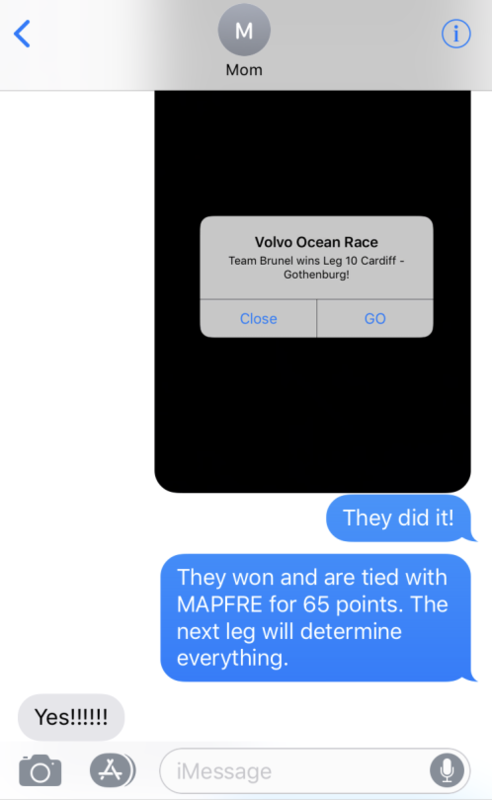 Brunel has taken a tiny lead over MAPFRE in the western group; Dongfeng is sailing 5 miles off the Dutch coast in the east. Seven teams have covered 45,000 miles in nine months of racing. There has been a collision and sinking, a dismasting, and, tragically, two deaths. 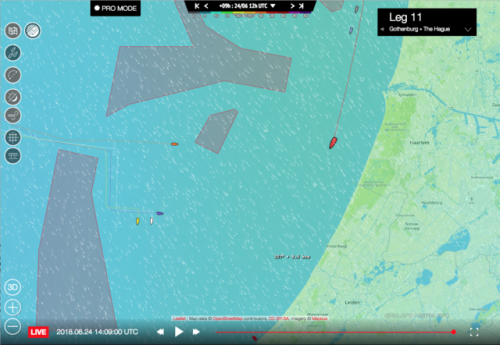 I feel like I’ve come to know the sailors, watching and annotating 1,331 on-board videos (and counting). To me they embody the best part of what it means to be human. I’m proud of all of them, and I can’t wait to see who wins. 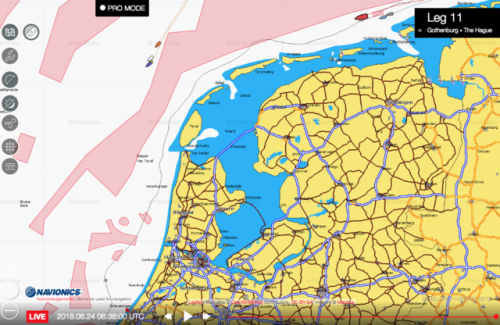 All the teams have talked in the latest videos about how much this leg has been like a three-day in-port race, with constant maneuvers and hardly any sleep for anyone. It must be quite an emotional ride on board right now. 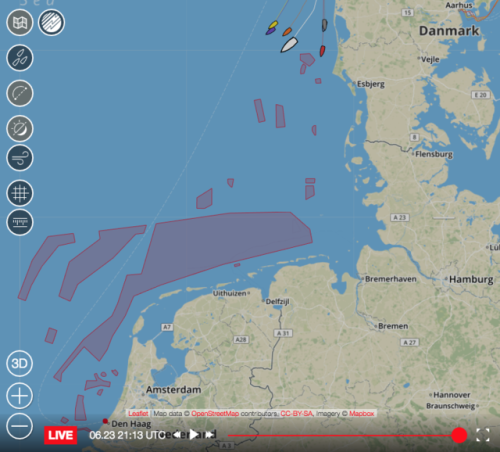 And big conditions: The live helicopter shots of them surfing at 25 knots down the Danish coast in the past few hours were amazing. Win or lose, they are going to be exhausted when they finish tomorrow. Ooh, split developing with the upcoming exclusion zones…. Ooh, split developing with the upcoming exclusion zones. Dongfeng appears to be taking the inshore route, Brunel is going outside, and it looks like MAPFRE has decided to go outside with Brunel. In the on-board interview they did an hour ago with Libby on Scallywag it sounded like she was saying the inshore route was strongly favored. With Brunel, given that they were behind, taking the less-favored option makes sense; might as well risk it at this point. But for MAPFRE, going outside seems like more of a high-stakes gamble. 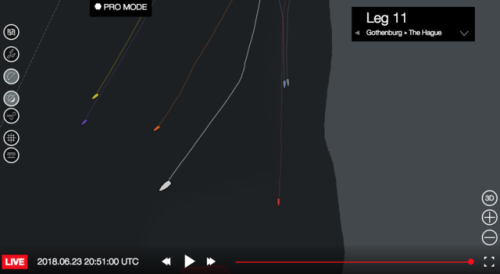 They were leading Dongfeng (though just barely). 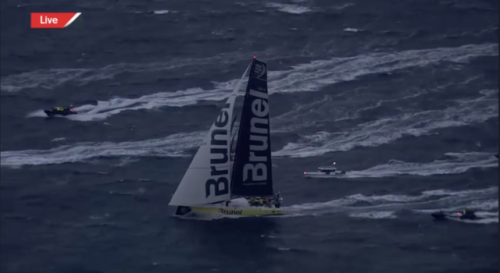 But going outside with Brunel means conceding the race if the in-shore route really is better. So Joan and Xabi must believe the outside route really is the way to go. Charles and Pascal either just won this edition of the race, or just put themselves in third. And with nearly 100 miles of separation zone and no way to get back across it, we might find out well before the finish which it is. @a-solitary-sea-rover: You can tell your mom her team is absolutely in this. Can’t wait to see who pulls it out in the next leg! Honestly, this is one of those things that happens every so often in sports that if you put it in a movie would be criticized as unbelievable. Ten legs over nine months around the ENTIRE WORLD, and now because of some incredibly badass sailing and a pass in the last few miles the top three teams are going into the final leg tied on points. They’re far enough ahead of the rest of the fleet that none of the others can threaten them, so the final result will be determined by whatever order those three boats finish in. Any of them can win. MAPFRE, who started incredibly strong and are still right there. Dongfeng, who have sailed so consistently well that even though they haven’t won a leg they would still have a big overall lead if it weren’t for the wind gods destroying them coming into Newport. And Brunel, who started off doing relatively poorly but have come alive at the right time. Chasing feels so silly sometimes. 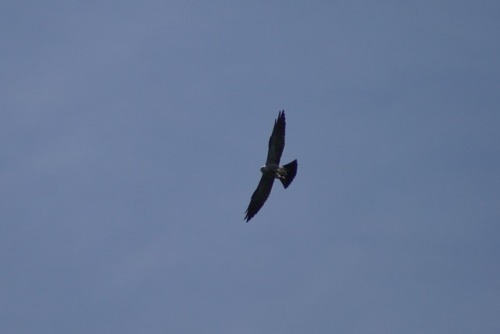 Today an out-of-the-area birder reported a juvenile Mississippi Kite along Alisal Road south of Solvang (fun fact: pretty much the same place Sean and Sinéad went for their Sundance retreat a few months ago). Mississippi Kites have only been documented three previous times in Santa Barbara County, and the mood among local obsessives was cautious/pessimistic. 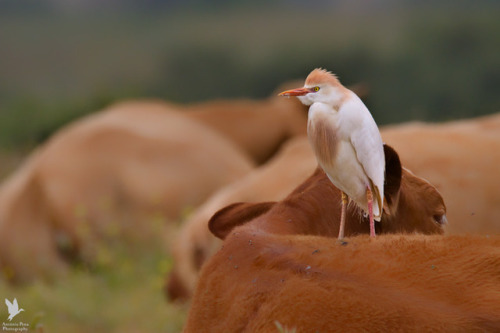 Then the birder posted a photo. Mark and Joan took off right away. They bird all the time (in fact were out birding already). 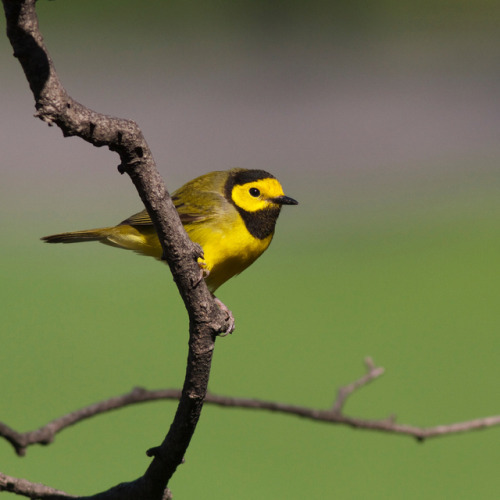 Mark is #1 in eBird for Santa Barbara County for the year; the closest I’ve been able to get is 9 birds behind him. Joan doesn’t do eBird, I don’t think, but if she did I suspect she’d be ahead of me too. I didn’t go after it. 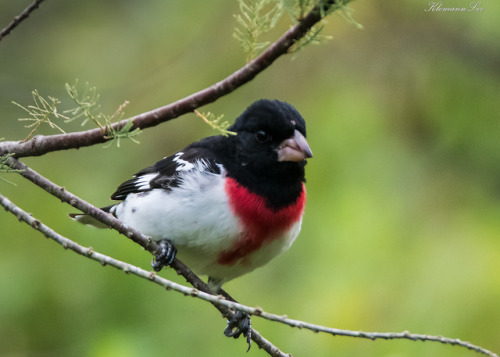 It was a work day, and though my hours are pretty flexible, taking an hour to drive to Alisal Road and an hour and a half to drive home (b/c of Santa Barbara’s mini rush hour) plus whatever time was spent in between looking for the bird would mean a lot of work time to make up. 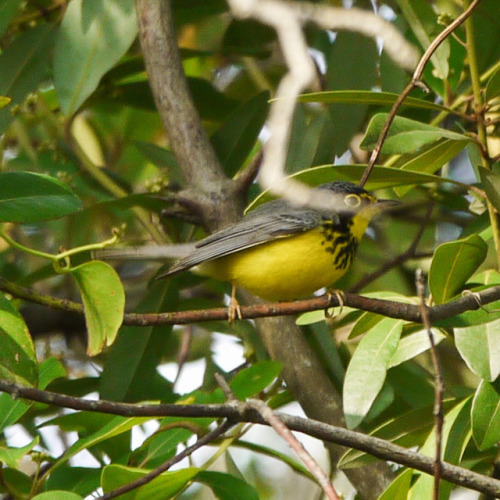 The fact that the bird had been reported once didn’t mean it would be easy to refind; rarities often keep moving. Except Joan refound the bird. So I grabbed my binoculars and went. 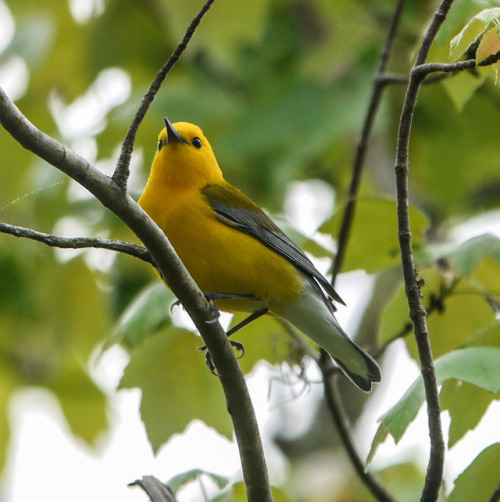 I ended up spending about two hours walking the road looking across the golf course toward where the bird had been seen last. At that point, hot and getting hungry, I gave up, said goodbye to the birders who’d been there searching with me, and headed home. 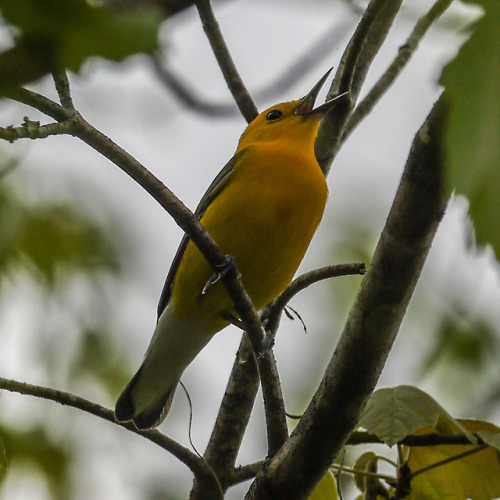 Shortly after arriving, as I was about to eat dinner, the group chat came to life again: Conor and Julie (who were on the Big Pine Mountain Survey with me last weekend) had arrived shortly after I left, and Julie had refound the bird. Sigh. I didn’t drive back. 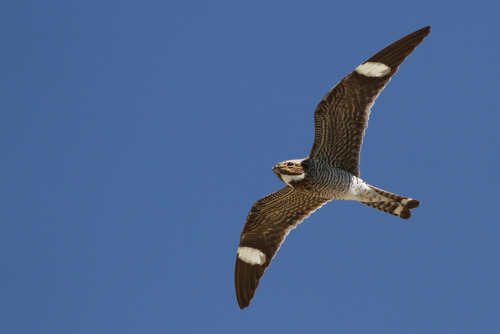 But I’ve set my alarm for 4 a.m.
With any luck, by this time tomorrow I’ll be headed to the Cuyama Valley to see if any of this bird’s smaller cousins (Lesser Nighthawks) are willing to go on my county year list. Wish me luck! Sophie Ciszek trims the main on MAPFRE, North Atlantic Ocean, 2018-05-25. 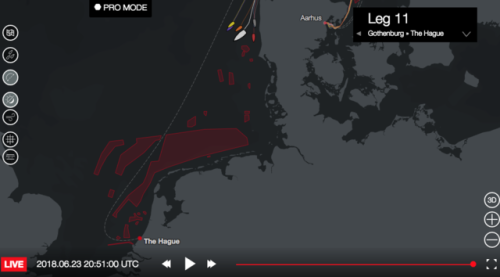 As of the start of Leg 9 MAPFRE is in first place in the Volvo Ocean Race.